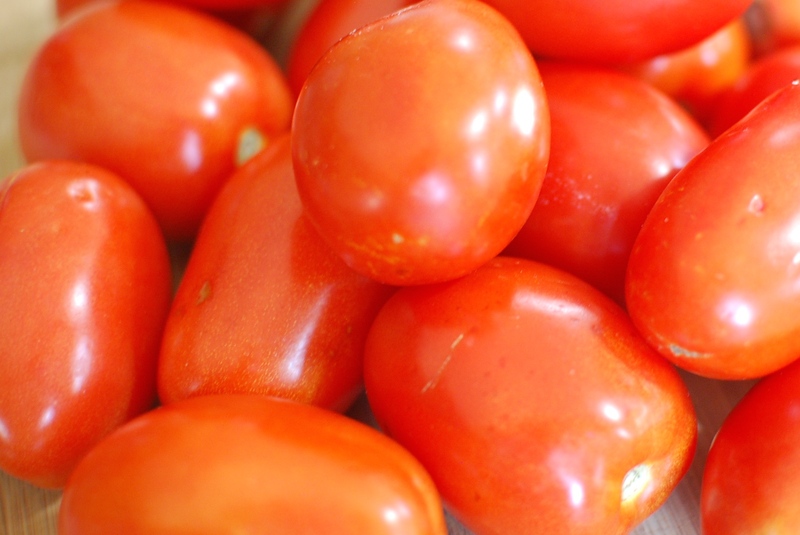 Who swaps out plum tomatoes? Well, whoever you are (and I’m guessing it was one of our half-dozen picker-uppers who ordered a supplemental 25-pound box from the co-op), I thank you. Your bag plus my bag gave me a four-pound quorum—just enough for a small batch of über-concentrated tomato paste. the freezer—I felt free to experiment with paste. Another adventure in really, really slow food, this paste’ll take you upwards of five hours, but most of that is unattended. My four pounds of fruit cooked down into a half pint (plus a couple spoonfuls) of paste that’ll enrich stews, soups, and the odd Bolognese this winter. Wash and roughly chop the tomatoes. I started out coring them—and got through about half when it dawned on me that I was going to be pressing everything through a food mill later on, anyway, so why bother? I stopped bothering. Since you’ll be milling these later, there’s no real need to core them, but I didn’t figure that out ’til mid-way through. 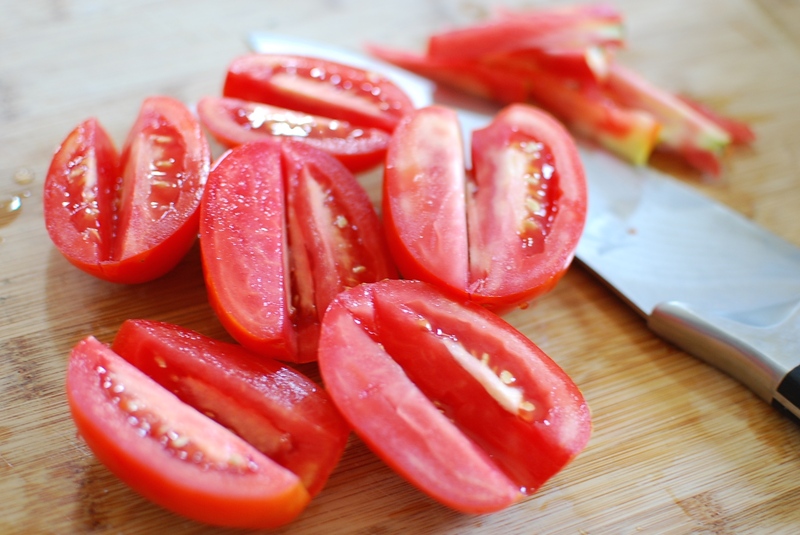 Put the tomatoes and olive oil in a wide skillet or deep saucepan, and bring to a boil over medium-high heat. Sprinkle in a little salt. Cook for 6-8 minutes, until the tomatoes are quite soft. 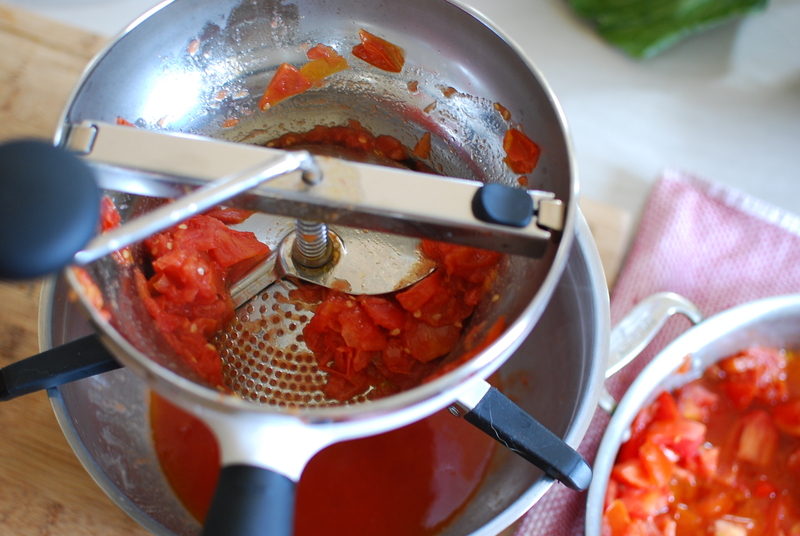 Strain out the skins and seeds (and cores) by running the tomatoes through a food mill or fine strainer. Press out as much of the pulp and liquid as you can. tomatoes through a fine-mesh sieve. Drizzle a small amount of olive oil into a rimmed 13×18″ baking sheet; smear it around with your fingers to coat the sheet evenly. 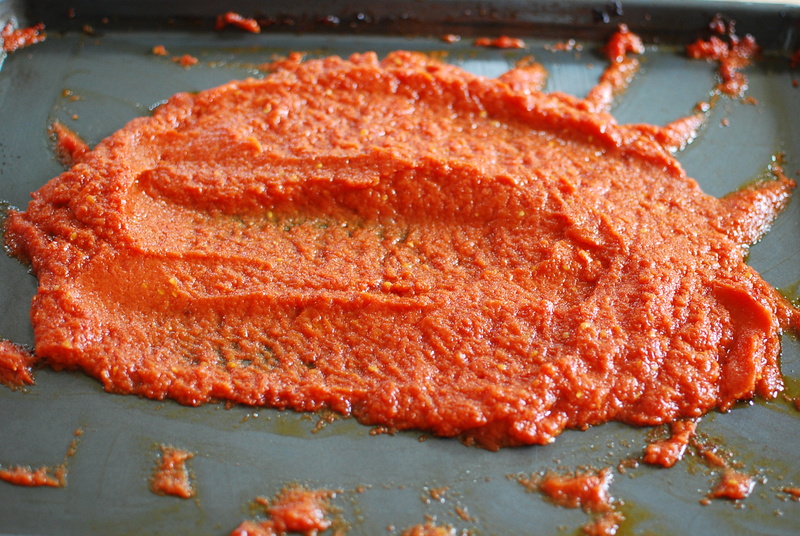 Pour the tomato purée into the sheet pan and shake to distribute evenly. Bake for about two hours, stirring every 45 minutes or so. careful loading the pan into your oven. 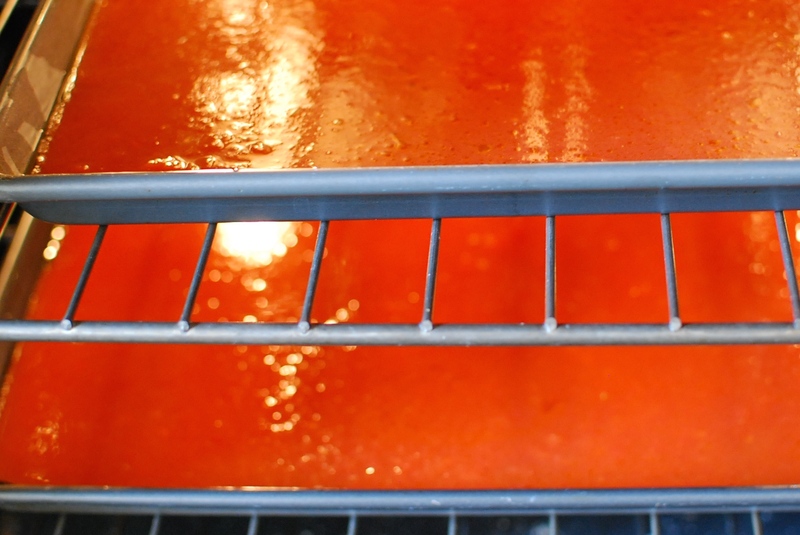 After two hours, reduce the oven’s temperature to 250º, and bake for another 2-3 hours (still stirring every so often) until the color deepens significantly and nearly all the water has evaporated. 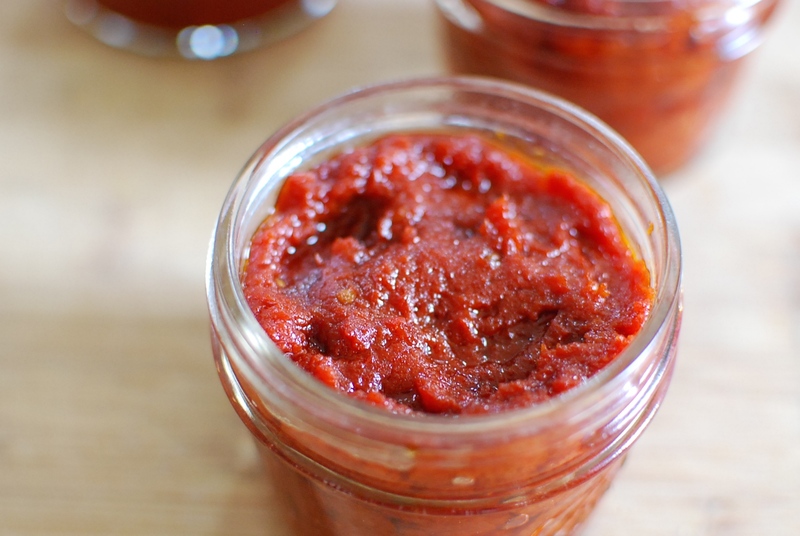 rich, thick, sweetly concentrated tomato sauce . . .
. . . or you could keep going. After another 2 hours at 250, you’re well on your way to paste. Spoon into small jars. 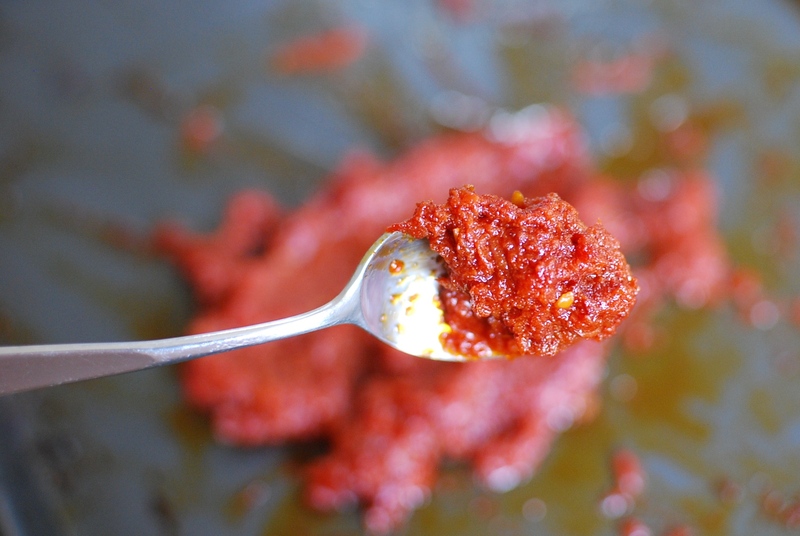 In the fridge, tomato paste will keep for six weeks or so; in the freezer, you’re good for up to a year. I usually press a strip of plastic wrap onto the surface of the paste before I seal the jar to help keep freezer burn at bay. What a score! I remember a time, when another CSA member placed both tomatoes and fresh herbs in the “donate” or “swap bin” – I couldn’t believe it, either. Of course, I took those home with me right then and there! Thanks for the great tutorial – pinning this for later, once I have a substantial amount of tomatoes in hand. Just picked my first serious haul this afternoon. …and now to get that food mill that I’ve been thinking about for a good two years! I test-drove a couple mills before settling on the OXO a few years ago. Way easier to clean and to swap out the blade discs than the others I tried. Good luck with your ‘maters. My own are winding down. Not much luck with my sauce plants this year — but the Brandywines have been spectacular. Enjoy!